I’m posting a bit early for today – on my way to Maine this afternoon. I’m running around furiously pulling together all the necessary art supplies I’ll need. I’m glad I’m going for a nice long visit because I have to check a bag anyway and vials of ink, tubes of paint and sharp scissors aren’t carry on friendly. I’ll have some really great sketch time on the plane and hopefully soon I’ll get myself a wireless tablet for quick digital and tree friendly sketching! A Pink Breast Cancer Awareness Apple! I sat down this evening very excited to create her apple. I had a clear idea of a hot pink apple with a chartreuse background painted in acrylics but, sometimes the creative process just happens and you don’t fight it. So…. this isn’t Sandy’s apple – it will have to wait until another day (and I have a new vision for it now too – lol.) Today’s apple sorta looks like a peach to me but – eh…. I’ll be my biggest critic I suppose. Hope you all like my Day Three Art Apple! I have so many ideas that I had a lot of trouble deciding what to do today. 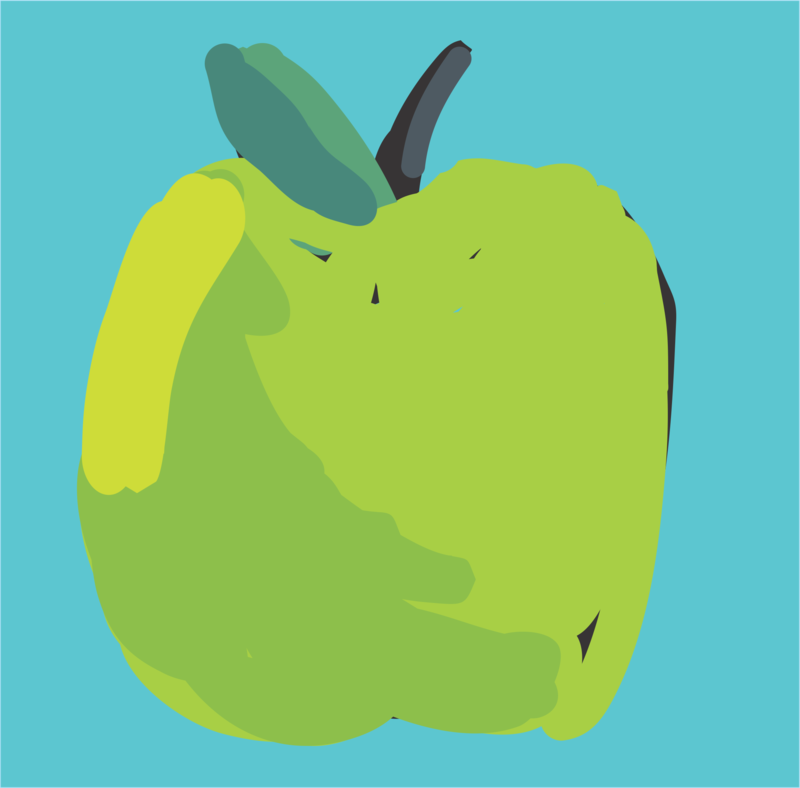 Hopefully tomorrow’s Art Apple will get posted earlier. Yea! It’s day two and I got the watercolors out and dusted off. I love my watercolors and the pallet I use when I paint with them. I had a wonderful teacher in college who I learned so much from and she showed me how to set up a watercolor pallet. You squeeze out the paints into the little wells and just leave theme there. I thought it was so strange at the time – “won’t they dry up” I thought. Duh. The water revives them just like the crayola ones we get in kindergarten. Paint has always seemed so precious to me (I’m trying to get over it) so I had a difficult time with the concept but it works and I love watching the color come to life when I add water after a long time away. My plan this morning was to do a sort of old school watercolor apple, which is always the first thing you paint in watercolor 101. And the plan was to get it done early and do some sketches and ideas for the coming week. Well… my Saturday got away from me. I’ve got the house to myself this weekend (miss you sweetie) and I puttered away. And in terms of the old school look – that didn’t work out so well – not much old school left in me I guess. Maybe one of these days! But – what came out was fun, colorful and I loved every second of painting it. Hope you like it too! So here’s the Concept: To give the gift of my art in a unique way. To bring awareness to Ankylosing Spondylitis and support my love of creating art. Idea: Make a piece of small art of an apple each day starting October 1, 2010 and give the original away and document the process online via blog and website. Start by posting it on my blog – thefeedingedge.com. Post the piece each day and follow up with posts of who I gave the original to and a story about it. Prints will be available for sale onwww.ArtAppleADay.com. Sharing my art with the world. Background: An apple a day keeps the doctor away has its beginnings dating back to 1866 as Welsh folk proverb. http://www.phrases.org.uk/meanings/an-apple-a-day.html . I will use the image of the Apple every day as a way to help people with a horrible disease by bring awareness, giving gifts of the pieces to my supporters, AS survivors, and people who need a piece of joy, and by selling the prints to support my efforts and future donations to great causes for health. Specifics of Art: A small manageable daily drawing/painting/mixed media piece produced each day. A 6” x 6” piece of paper with a 5” x 5” image – no other restrictions.